If you're anything like us, summer is a sad time for you. While there are a lot of TV shows that air in the summer, it's also the time when most TV shows are not airing. And by most TV shows, we mostly mean Brooklyn Nine-Nine. Fans of the formerly Fox comedy had quite an emotional few weeks as the show was canceled by Fox and then picked up by NBC, and then Jake married Amy in a beautiful season finale. Now it's like, what are you supposed to do while you wait for it to return? We have (no joke here whatsoever) rewatched the entire series, went to a Lonely Island concert, and watched both Hot Rod and Popstar, but that's just how we've been handling this lack of the Nine-Nine. 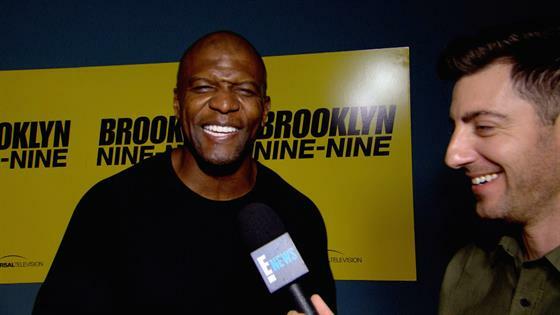 Here are the suggestions that Terry Crews, Andy Samberg, and Joe Lo Truglio gave E! News' Will Marfuggi at the show's FYC event earlier this month. 1. While you're knitting, have the show on in the background. 2. While you're making a boat, like just hammering or something, just let Brooklyn Nine-Nine play in your life. 3. Stay in shape, exercise. 4. Be healthy, eat right. 6. Stay ready, because you never know when Brooklyn Nine-Nine will suddenly be back on the air. Brooklyn Nine-Nine now airs on NBC.